Good morning! Yesterday marked exactly 34 years since the release of Bruce Springsteen's "Born in the USA." The emerging White House plan to throw an economic lifeline to struggling coal-fired and nuclear power plants would likely thwart progress on cutting greenhouse gas emissions, even though nuclear generation is the largest U.S. source of zero-carbon power, some analysts tell Axios. Between the lines: More coal-fired generation than nuclear power is likely to shut down in the coming years absent strong federal intervention — so Trump's plan would benefit coal more, altering forecast GHG emissions. "I think more coal is likely to be at risk of shutdown from poor economics than nuclear, so the impact of subsidizing uneconomic plants would be even worse from a climate standpoint." Why it matters: This underscores how climate advocates who are increasingly fearful of a wave of nuclear plant closures — a topic we recently explored here and here — are still without a policy ally in the White House despite the administration's support for nuclear. To be sure: Uncertainties abound, such as what the actual White House policy will ultimately look like and what would have been the exact mix of natural gas, renewables and other resources that would have replaced the propped-up coal and nuclear plants. One possible future: Council on Foreign Relations energy expert Varun Sivaram was kind enough to do some back-of-the-envelope modeling. Sivaram looked at the effect of freezing coal and nuclear generation at their 2017 levels, rather than allowing both to drop in accordance with the most recent Energy Information Administration long-term forecast. "This results in more production from coal and nuclear; the additional coal electricity generated in 2025 is about 24% more than the additional nuclear electricity generated in 2025," Sivaram said. The result of the administration's actions, he said, is that it "would increase emissions in 2025, relative to 2017 levels, by 0-5 percent, depending on how much natural gas and renewable electricity would be displaced by the additional coal and nuclear electricity." Get ready: Tesla CEO Elon Musk will take questions today at the Silicon Valley electric car and solar company's annual shareholder meeting. Why it matters: The company is under intense scrutiny as it tries to get past months of hiccups on the production scale-up of the Model 3 sedan, among other reasons. What to watch: Bloomberg has a nice rundown of the corporate governance and Model 3 topics in play. They note that while hundreds of thousands of people have put down $1,000 deposits for the Model 3, Tesla "has been coy about the rate at which reservation holders are following through with orders when invited to configure their sedan." "Converting its almost $1 billion in customer deposits into orders will obviously be key to Tesla sorting out its cash issues," Bloomberg reports. The big ask: Per Bloomberg, "The U.S. government has quietly asked Saudi Arabia and some other OPEC producers to increase oil production by about 1 million barrels a day, according to people familiar with the matter." Quick take: The request signals the delicate politics of the White House moves to punish Iran's energy sector with renewed sanctions while avoiding political blowback from higher prices. Trade: Via S&P Global Platts, "The Trump administration is pushing to greatly expand exports of crude oil and other domestic energy products to China, but tariff threats and disputes could ultimately hinder energy trade flows across the Pacific." Business: Per Reuters, citing people familiar with the matter, "ConocoPhillips is preparing to offload its stake in Cenovus Energy Inc., which it acquired as part of an asset sale to the Canadian oil and gas producer last year." Russia: Via the Financial Times, "Despite US and European sanctions and ever-increasing technical demands that some analysts said would be beyond Russian producers, the country’s oil and gas industry is booming, riding a surge in prices and a weaker rouble, and encouraged by initial successes in the largely untapped Arctic." Over in our Expert Voices section, the World Bank Group's Jonathan Coony writes that for the more than 1 billion people without reliable electricity access, advances in off-grid solar (OGS) solutions present significant promise. State of play: A recent World Bank report showed that by 2017 the global OGS sector was providing improved energy access to an estimated 73 million households. Yes, but: Half of the projected $5.7 billion for OGS to hit its full potential from 2017 to 2022 still needs to be raised. While established multilateral and commercial financiers are expected to partially fill this gap, new financial innovations that tap less traditional investors also show strong potential to help meet the sector’s growing needs. 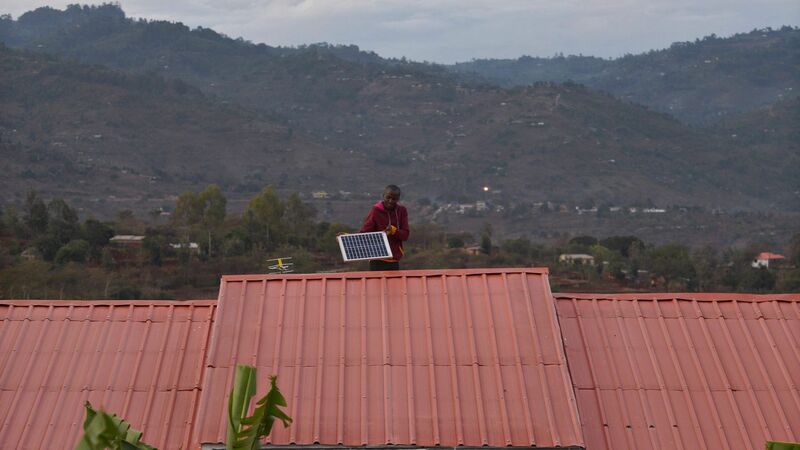 Innovations such as pay-as-you-go business models have combined with falling photovoltaic-cell costs to open funding channels on terms acceptable to newer investors. This financing offers OGS companies the resources to expand their activities and increase customer access. The details: Several features make the OGS market particularly suited to today's financial services innovations — such as blockchain, cryptocurrencies, crowdfunding, receivables securitization, and data-enabled lending. Coony is global lead for green competitiveness at the World Bank Group. Intriguing: A new HSBC research note predicts that major oil companies could translate higher cash flows from the oil price recovery into higher spending on their low-carbon energy arms. Why it matters: Europe-based majors including Shell and BP have already been increasing their investments in renewables, electric vehicle infrastructure and more. But those investment remains a tiny fraction of their overall spending, and climate activists say far more aggressive steps on low-carbon energy are needed to avoid highly dangerous warming. "A pause in upstream M&A activity, coupled with the strength of free cash flows, could create a window for Big Oil to buy assets in new energies (broadly defined)," write HSBC analysts Gordon Gray and Kim Fustier. "The Majors know they cannot grow their fledgling new energies divisions solely through organic investment: it would take far too long to create meaningful businesses and leave them lagging the global energy transition," they add. Axios' Amy Harder reports ... Facing lawsuits and activists accusing it of misleading the public about climate change, Royal Dutch Shell CEO Ben van Beurden talks about how the company has handled the issue — and gives a nod to the future. State of play: Shell is among several large oil companies named as defendants in lawsuits filed by U.S. cities and other local governments seeking billions of dollars in damages from climate change. "Everybody will have a different perception. My perception is that we have been talking to governments about climate change as a real risk from the 90’s. We believe therefore that governments for a long time haven’t responded enough, haven’t done enough. You could argue, it’s also back at us again. Maybe we haven’t been assertive enough, maybe we haven’t been clear enough or maybe even omitted our obligations as a member of society to perhaps shame governments into doing the right things. Maybe it’s that extreme you have to be," van Beurden said.